These devices are used to extract fauna from a wide range of samples brought in from the field. The principle is simple enough; inside the device a light bulb is held over a sample, this serves as a heat source which will gently heat the sample, and a strong light which will deter the insects from ascending, which is generally their natural behaviour, in order to escape. A sample, usually up to about a litre in volume, is placed on a circular wire mesh lying inside a funnel and, when this is heated, the insects will enter the funnel in order to escape the heat. Beneath the funnel a container is placed that will collect the sample; this usually contains a liquid that will quickly drown the insects without damaging them. 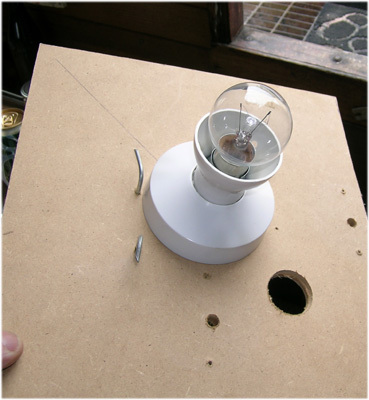 Commercial models are self-contained and, apart from a ventilation hole over the light bulb, sealed when in operation. These are well made and, having had considerable experience with some of these, we think it highly unlikely that anything should escape during an extraction. These are expensive but for a fraction of the cost a perfectly functional and practical model can be constructed with only the minimum of skills although it should be stressed that the electrical part needs to be done competently. An example of how to build such a device, based on our own experience, is given below. It should be realised that while an integrated model is desirable because it is easy to operate and can be put out of the way and ignored while in operation, it is perfectly feasible to exploit the principles to extract samples with only the minimum of equipment. A large funnel supported in the opening of a large jar or clamped over a beaker and heated by a bulb suspended over it or by a lamp will do the trick perfectly well although there is the risk that specimens might escape from such an exposed sample. When using these things for academic studies it will be desirable to standardise things like sample size, running time and which bulbs and collecting fluid to use etc. but in general, when they are being used simply to record local fauna, there are only a couple of things to consider. The fluid into which the specimens drop is a matter of personal choice or expedience; alcohol is fine (e.g. 50% ethanol, isopropanol etc is fine and so, at a somewhat desperate push, Vodka will do the trick) or dilute detergent (unscented type e.g. Teepol is best) will do nicely and we have read that dilute antifreeze is sometimes used. Plain water is not appropriate because specimens may escape the collecting vessel and then be overlooked, more especially so if these are adapted to this environment e.g. Helophorus, Dryops, Hydrobius etc. Which power light bulb to use depends on the nature of the sample. Both clear glass and frosted bulbs work adequately but, very obviously, low energy bulbs are more or less useless. Many samples need to be heated slowly, especially if they are dense or dry; with dense samples the occupants will need time to evacuate and with a dry sample the heat will penetrate quickly and so may kill slower moving larvae etc. A 15 watt filament bulb held a couple of inches above the sample and run for at least 24 hours will generally extract the fauna from such a sample. After running a sample with such a low power bulb it is worth looking carefully at the sample as it may still be damp inside and still be harbouring specimens. The ambient temperature will affect this e.g. we run samples in a garden shed and they take much longer to dry out in the winter. On the other hand, light and open or very wet samples e.g. 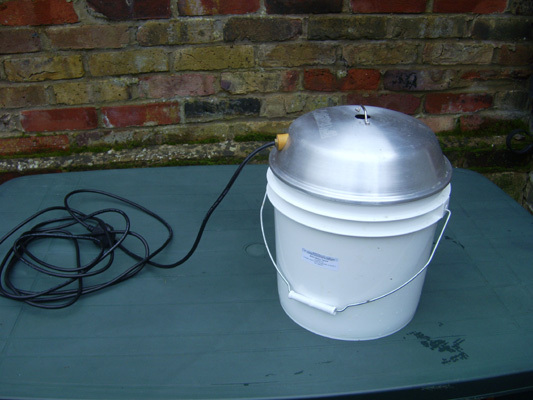 water weeds or compost can be dealt with quickly by using a stronger bulb, perhaps 25 watt or even 40 watt. Insects in an open sample e.g. leaf litter or bark will be able to evacuate quickly and such a sample can be processed within three or four hours with a 40 watt bulb depending, of course, on the ambient temperature and moisture content. Very wet and dense samples e.g. pond side vegetation with roots and soil attached or compact sphagnum can be treated similarly although you will need to get a feel for these; with a 40 watt bulb the outside of the sample will dry quickly while the inside may take 24 hours or more, in general the inside of a sample will not begin to heat up until the outside is quite dry. Trying to accelerate the process by using a more powerful bulb will probably succeed only in cooking the occupants. 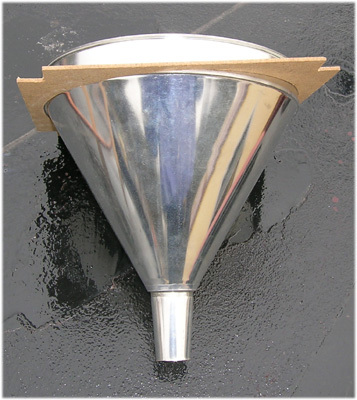 Operating a funnel or a few funnels to best advantage is a matter of experience; it is best not to have too many samples waiting to be dealt with as they may deteriorate, more especially so if they are stored in sealed plastic bags, much better to obtain fresh samples every couple of days and keep them cool. As to what to put into the funnel the answer is just about anything that looks likely to be harbouring beetles as well as, of course, anything that does not! This may not seem like much of an answer but by experimenting with samples we often produce surprising results and trying to give precise guidance based on our own experiences will probably do more harm than good in the sense that it might restrict the imagination of the reader. In any case where we have found something interesting we will usually mention it on the relevant page. Generally speaking, samples from decaying wood, fungi, reed and leaf litter, pond debris and decaying vegetation of all kinds will give good results but experimentation is the key to finding interesting stuff. Finally it should be stressed that because these devices can produce such good results there can be a temptation to rely on them too much e.g. 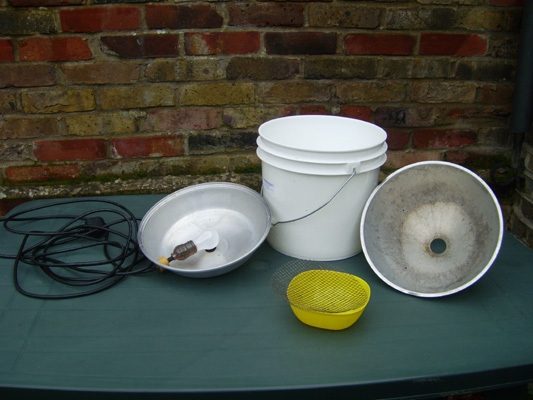 samples of dry dung or compost might be dealt with more quickly by sieving or examination under strong lights rather than occupying the funnel. In any case it is always a good idea to look through a sample for larger or more conspicuous specimens before using the funnel. We find the easiest way to bring back samples from the field is to use sealable plastic bags, in most cases the sample will come to no harm if kept for a few days in the cold, a fridge is idea if a little unsociable. A berlese funnel consists of three main parts; A funnel, a light and a frame to support the funnel in an upright position and to mount the light. The funnel. This should be metal not plastic, although the wattage of the lamp used should be pretty low it wouldn't be a good idea to leave a plastic funnel under an heat source for a long period of time as will be the case when using the berlese. The minimum diameter is probably 25cm but 30cm is probably better. You can get metal funnels pretty easily online but try your local market or one of those large out-of-town markets first. I bought my funnel online for 12 pounds online only to discover that they were for sale in the Watford market for about 5 pounds. The light. This consist of a lamp socket, lighting flex, preferably with an earth cable, the length of the flex will depend on the distance from the power source you intend to run the burlese. Optionally you can use a rocker lamp switch but it's not strictly necessary, and of course a plug. The frame. This is made of 'stripwood' held together by brass screws. Drill and drill bits, the size of which will depend on the screws used. Various electrical tools for the wiring; small screwdriver, stanley knive etc. Since the dimensions of the frame will depend on the size and design of the funnel you have I'll describe the construction of my berlese which used a 25cm funnel with a small lip on the upper rim. My funnel was in total 30cm deep which I trimmed to 23cm but reducing the length of the spout with a hacksaw. The frame is made from 'stripwood'. You need to make sure the frame is square and level and the quality of most planed timber sold by most DIY stores, in my opinion, is pretty rubbish, warped or curved, so best to pay the extra for 'stripwood' which is much better quality; straight and not full of knots. 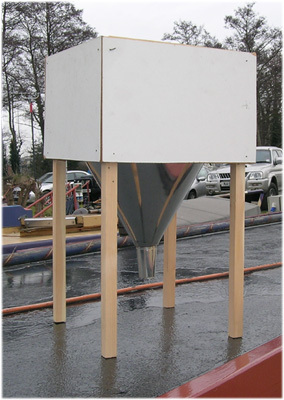 The frame consists of 4 legs, 8 horizontal battens which hold the legs together, a hardboard base plate which supports the funnel and a more substantial plywood or MDF lid which holds the electrics/light. Legs are 2cmX2cm cut to 50cm lengths. After you have cut them align them alongside each other using the carpenters square and trim the longest ones where necessary to ensure they of exactly equal length. The battens were made from 35cmX13cm stripwood, the extra width giving room for the screws. These should be cut to 8 26.5cm lengths and trimmed as the legs to ensure equal lengths. It's important to make sure all parts are the correct length or getting a completely square frame that doesn't wobble will be difficult. Take two legs, place them alongside each other and mark a line on each 31cm from the bottom. Drill two holes to house the screws about 1cm from either end of all the battens. Offset them slightly to avoid the chance of splitting the grain in the legs. With the two marked legs place a batten over them and drill a small quide hole in both legs. Screw both holes with 2cm no 6 brass screws. Using a carpenters square make sure the batten is at right angles with both legs and the drill the second holes at either end and screw them. Do the same with another batten at the top of the legs but the top of the batten should be above the top of the legs to house the lid. Now repeat the whole process with the other two legs. Now you have two sides of the frame which have to be connected with the other four battens. This can be a bit awkward and it depends what sort of working area you have, I clamped the legs flush to the side of kitchen worktop and drilled the battens from there. The best thing is to only drill and screw one hole in each batten and place the frame upright, make sure everything is level and stable and then drill and screw the second holes. With the constructed frame measure the inside dimensions to the outside edge of the battens. Cut the hardboard base to these dimensions and then cut out each corner to fit the legs. The base should fit neatly inside the frame resting on the battens. Place the funnel upside down on the on the base and draw round the funnel. With a jigsaw (or fretsaw) cut a hole in the base just inside the drawn line. This wil enable the funnel to fit but be held in place by the funnel's lip. This should then be placed inside the frame. Now measure the dimensions of the inside of the top of the frame and cut the lid to fit. Away from the centre drill at least two large holes in the lid to ventilate the berlese. Drill a smaller hole in the centre to allow access for the light cable. Mount the lamp fitting in the centre of the lid and conect the cable as per the instructions given with the lamp fitting. The last step is to mount a piece of wire mesh about half up the funnel. The best size is 1/4 inch but most diy places only sell a larger gauge which will suffice. 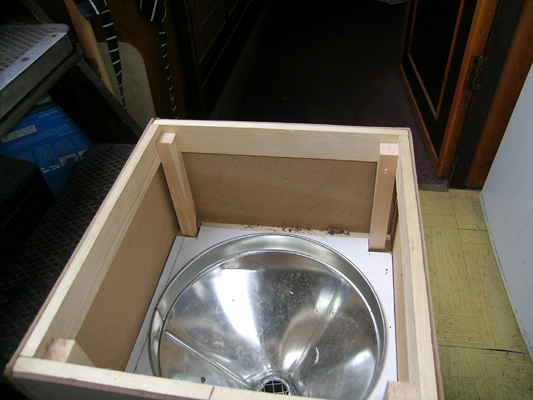 It's not strictly necessary but you can, as I have done, cover the open sides of the funnel with hardboard. And now you have your berlese funnel.